With this year’s slow emergence of spring in Michigan, the desire for warm weather activities and attractions seems stronger than ever before. A well-known gem throughout Michigan, farmers’ markets have become a staple in many communities in supporting healthy eating, local farmers, and community development. 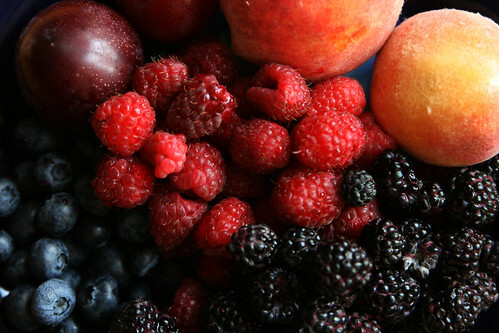 Farmers’ markets provide the best access to fresh, locally grown food, , next to picking the produce yourself of course! Produce at the markets is at its freshest and tastes the best because the fruits and vegetables showcased are picked at the peak of each growing season. Shopping at farmers’ markets also supports the individual farmers, keeping money we all spend on food as close to our communities as possible. As an experience, visiting a farmers’ market gives you the opportunity to try new fruits or vegetables, receive recommendations from farmers and other vendors on recipes and preparation, and get your kids involved with picking out items. To kick off our series on farmers’ markets throughout Michigan, Saturday May 4th marks the opening of the Outdoor Market at the Downtown Market in Grand Rapids. The Outdoor Market hosts all of the farmers’ market features and vendors associated with the Downtown Market (the indoor market opens later this summer). The Outdoor Market will be open on Tuesdays from 8am-1pm, Thursdays from 4pm-7pm, and Saturdays from 8am-1pm. The Outdoor Market brings another, bigger, farmers’ market to West Michigan in an otherwise underutilized area. The list continues to grow, but some of the farmers and vendors expected at the Outdoor Market include: Blue Stone Farm, Crisp Country Acres, DeYoung Orchards, Fantabulous Fudge Co., Green Thumb Acres, Klackle Orchards, Melody Bee Farm, Nourish Organic Market, The Local Epicurean, Trillium Haven Farm LLC, Visser Farms LLC, and many more. Some of the farm vendors are also offering CSA sign ups. CSAs, or community-supported or shared agriculture, offer members a weekly or biweekly bin of fresh produce shares dependent upon what is available on the farm at that time. CSAs are a great option for any type of consumer because you learn about produce you may never have tried before, you support the farmers in your community with a regular sale, and you’re eating healthier in the mean time! What Michigan farmers’ markets are your favorites?